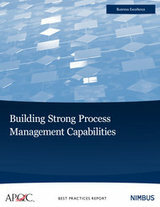 Developing, implementing, and sustaining process management capabilities can be challenging tasks. Organizations feel a strong need to find ways to identify, document, and study outstanding models of process implementation and management. The report discusses focus, maturity, and motivation as they apply to process, and it contains additional subject matter expertise from Chris Taylor of Nimbus.